One of the wonderful things about working at a historical site is that one never tires of the questions it can raise. As is well understood today, one cannot research or interpret the history of a southern plantation without understanding the history of the people, both black and white, since both made the plantation possible. To deny one is to deny a complete and accurate history of the site. We are fortunate that members of the Drayton family left documentation and material culture that help us understand and present how their history evolved over time. But history of this site didn’t stop in 1865 or 1900, and our charge is to tell that more complete story. The exciting thing about the more recent past is that there are persons who can share their insights and personal reflections with us and add important human dimensions to the story. The Bowens family is an example, and to understand their heritage Drayton Hall has been actively involved in the research of archaeology, material culture, written documentation, photographic evidence, and oral history. 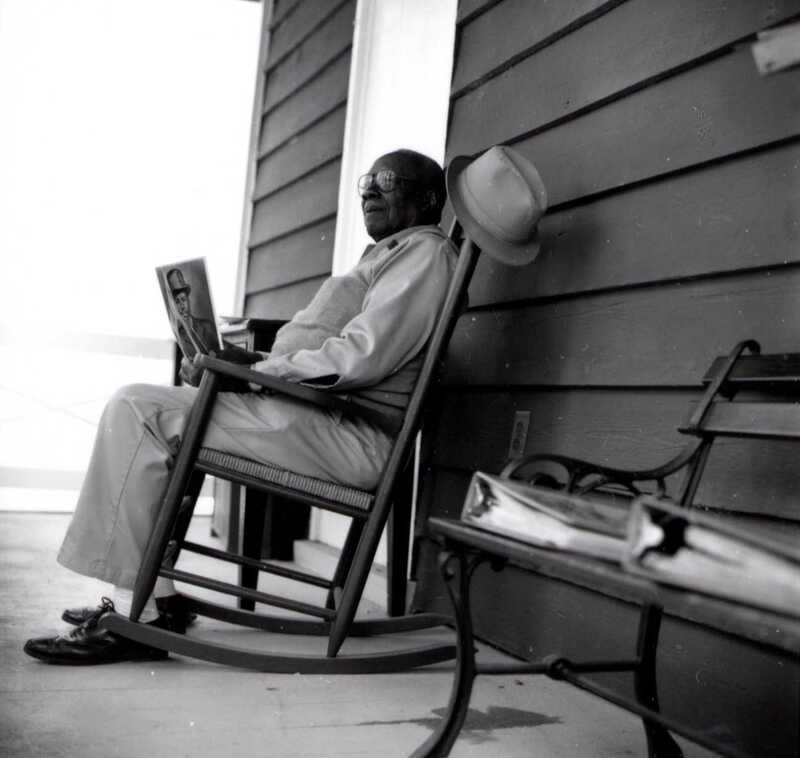 Richmond Bowens, born at Drayton Hall in 1908, sat in his rocking chair on the Museum Shop’s porch during the 1990s where he would recall his 23 years of life growing up on the property between 1908 and 1931 when Drayton Hall was still privately owned. The rocking chair is part of Drayton Hall’s collection. When I arrived in 1989, I was fortunate to meet Richmond Bowens. Born here in 1908, Richmond was the grandson of freed slaves and a remarkable resource for oral history. He loved history and also loved sharing history with others. He was very careful in explaining history as he remembered it, and did not venture forth in conjectures about things he did not know. We recorded his recollections as he walked the grounds, touring the cemetery where his ancestors were buried and the site of the tenant house where he lived as a child. Historian Charles Joyner from Coastal Carolina University and its media staff videotaped him in the mid-90s as he advised the excavation of his tenant home site, and the film was shown on the History Channel and on SCETV as well as at professional conferences as a model for interdisciplinary research. Richmond was the gatekeeper at Drayton Hall and took that job very seriously. He welcomed people to the site as an ambassador, and also stopped people who tried to slip in without paying! In the early 1990s, he transitioned from the gate to the museum shop where he served as our unofficial “historian in residence.” He shared his recollections with visitors so that they could closely relate to the world he was describing, and presented photographs, census reports documenting his family, and actual stalks of rice and ears of corn so he could explain agricultural practices he knew growing up here. According to his family’s history, his ancestors came over with the Draytons in the 1670s from Barbados, so his history parallels that of the Draytons in America. As a result of all this, people would sit on the bench by his rocking chair and talk to him for hours. In 1998, Richmond passed away and is buried in the cemetery here among his ancestors. To continue his legacy, we began Connections: From Africa to America and infused his recollections into that program. We’ve also recorded descendants’ stories of life here in the 20th century in order to better answer those many questions a southern plantation site may generate. Richmond Bowens’ legacy is continued by his cousins Catherine Braxton and Rebecca Campbell as well as other descendants. The two sisters grew up in downtown Charleston and visited Drayton Hall from time to time. When Richmond was working here they came to visit him, and he shared his knowledge with them. They too are deeply concerned about the preservation of history and have helped Drayton Hall in a range of significant ways over the years to learn more about the history on the site and of specific individuals, as seen in the interactive DVD tour of the landscape. For more insights into their thoughts about Drayton Hall, I recommend watching the video produced by C-SPAN that features Catherine and Rebecca in the African American cemetery at Drayton Hall, which is available via this link. Click the image above to watch the video by C-SPAN and American History TV. Featured in this video are interviews with Catherine Braxton and Rebecca Campbell, descendants of both freed and enslaved African Americans at Drayton Hall.